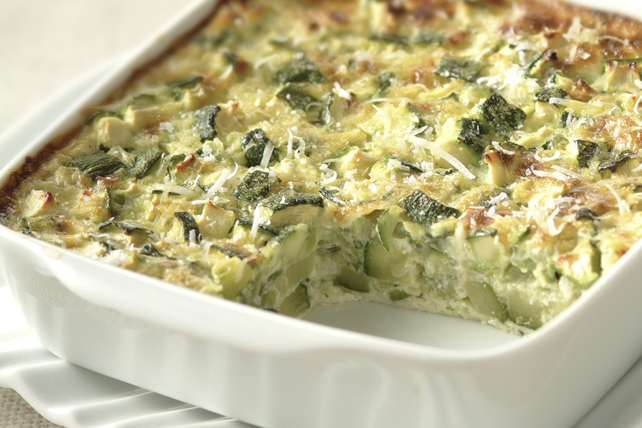 Fresh green zucchini serve as the perfect base for this cheesy egg bake. Serve this delicious side dish as part of your next dinner or brunch menu. Combine flour, basil, baking powder and pepper. Whisk eggs and milk in large bowl until blended. Add Parmesan and 1 cup shredded cheese; mix well. Stir in flour mixture. Add zucchini; mix well. Pour into 9-inch square baking dish sprayed with cooking spray; top with remaining shredded cheese. Bake 35 to 40 min. or until knife inserted in centre comes out clean. Substitute chopped fresh sage for the basil.